C.K. 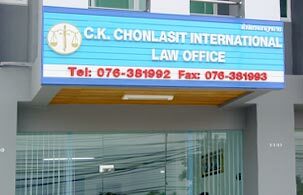 Chonlasit International Law Office has a variety of experienced lawyers, consultants and international advisors who can assist you with all of your legal needs. We are able to consult you in Thai, English and German languages which make communication more comfortable. Business hours are on weekdays from 09.00 - 17.00, weekends & public holidays closed.